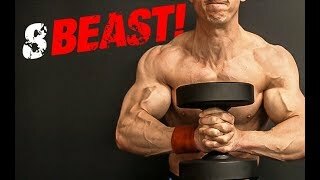 ﻿ Stop Doing Dumbbell Bicep Curls Like This! Dumbbell bicep curls are one of the most popular biceps exercises performed in the gym or at home. The problem is, it is also one of those arm exercises that is most commonly performed wrong. 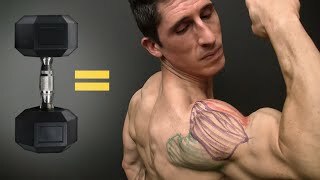 In this video, I’m going to show you the best way to do the standing dumbbell curl for bigger biceps and some other added benefits you may not have been aware of. First we need to start by looking at what is not optimal about the standing alternating dumbbell curl. When you alternate your arms during the reps you have a period where one of the arms is resting. This is taking the tension off of the biceps for the 2-3 seconds that it takes to perform the rep on the other arm. If you are training for metabolic hypertrophy, this brief period of rest is enough to sap all of the benefits of that form of training and is therefore something you want to avoid. The next thing is that by alternating your arms during the movement you are sacrificing a great deal of core involvement that you could be getting by not doing this. Think about it. When you curl the weight up, the momentum of the load wants to tilt you backwards and make you lean back with the weight. The only thing that helps you to prevent this is the stabilization and contraction of your abs and core to not let that happen. If the load that you are lifting is in just one hand, you will only be having to control half of the weight. In this example I am curling 30 pound dumbbells. My core will only have to contract hard enough to control the thirty pounds. If on the other hand I lift the two dumbbells at the same time, then I will have to work that much harder in order to control the 60 combined pounds that are in my hands. Finally, there are often times many muscle imbalances that are developed by performing your dumbbell bicep curls in alternating fashion. If you are training for strength but one side is weaker than the other you might see that your arm struggles more to get to the top. At the same time, you might find that you simply cannot move the weight at the same speed that you can on your stronger, more powerful arm. Both of these are problems but not easily seen when you are doing them one arm at a time. If on the other hand you switched to the simultaneous standing dumbbell curl you would notice right away when the imbalance exists. Simply watching as one dumbbell was curled faster and more unevenly than your weaker side would give you instant feedback that you needed to correct the strength imbalance. Forcing the dumbbells to move together is a great way to overcome whatever disparity exists and even out the development of your biceps. The same goes for the tension problem. By forcing the dumbbells to move together, there is constant tension on both biceps throughout the entire exercise. This makes for a move more capable of creating hypertrophy and for getting those biceps of yours bigger. Finally, the core becomes instantly more active and responsible for holding you steady when you switch to the double arm movement. Now you can do one other alternative and that is to alternate the direction of the arms during the movement but to make sure you are doing them at the same time yet again. 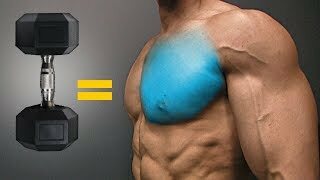 Here you get the same benefits of the tension and imbalance correction but you sacrifice a bit still on the demand of the abs since only one dumbbell is moving up at a time. In fact, you might cancel out the demand a bit because the other is counterbalancing and moving in the opposite direction. Either way, the standing dumbbell curl is best done when not alternating the arms while performing it. 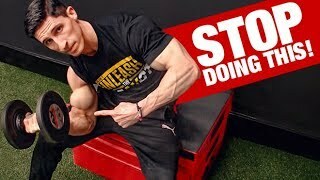 Now don’t get me wrong, even performed this way you are going to get better results than a much more non athletic bicep exercise like the concentration curl which has you sitting down for the entire movement. If you want to look like an athlete you need to train like one, and that means training on your feet at every opportunity. 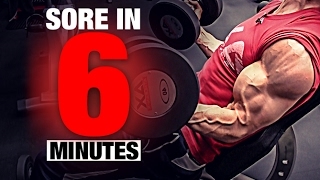 You can get our entire workout program that will help you to build not just big biceps but your entire body at http://athleanx.com and getting the ATHLEAN-X Training System.